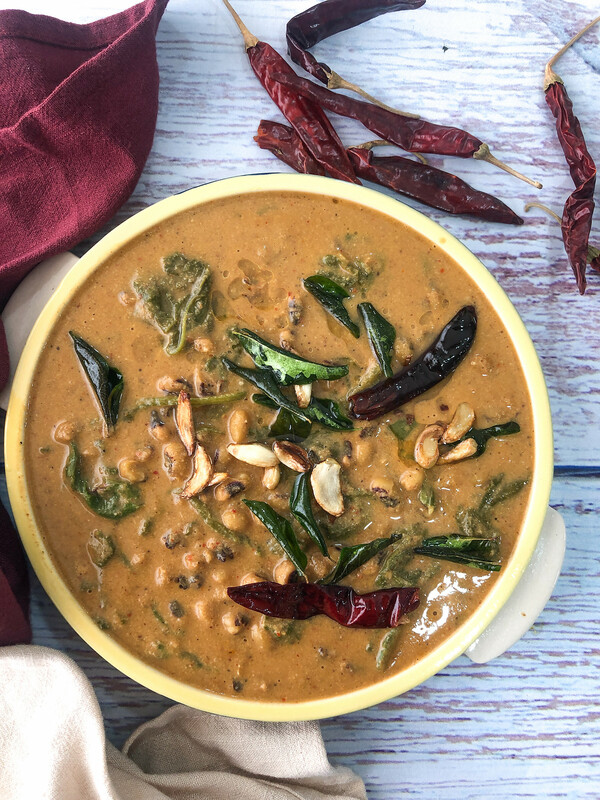 Palak Lobia Curry Recipe is a healthy and delicious recipe made with lobia or black eyed beans and palak cooked in a spicy, tangy coconut gravy. 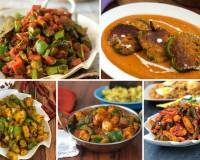 Make it for a nice weekday lunch or dinner. 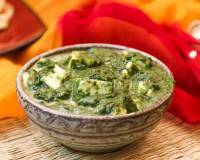 If you are looking for a calcium rich recipe then you must make this tasty Palak Lobia Curry. 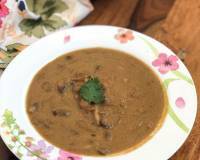 Cooked lobia or black eyed beans are simmered in a gravy made with dry roasted spices, coconut and tamarind paste. 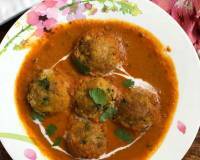 This curry tastes great with roti and rice. Did you know: It contains almost all essential vitamins and minerals including vitamin A, B1, B2, B3, B5, B6, C, folic acid, iron, potassium, magnesium, calcium, selenium, sodium, zinc, copper, phosphorus, etc. 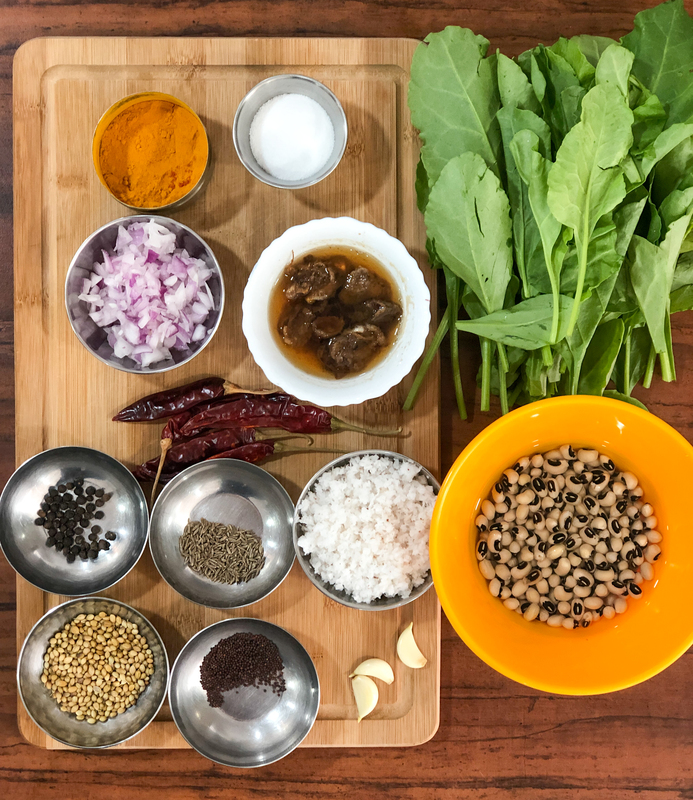 Serve Temper Palak Lobia with Pavakkai Poriyal, Drumstick Leaves Ragi Roti and Burani Raita for a nice diabetic friendly meal. Step 1: Prep all the ingredients and keep them ready. 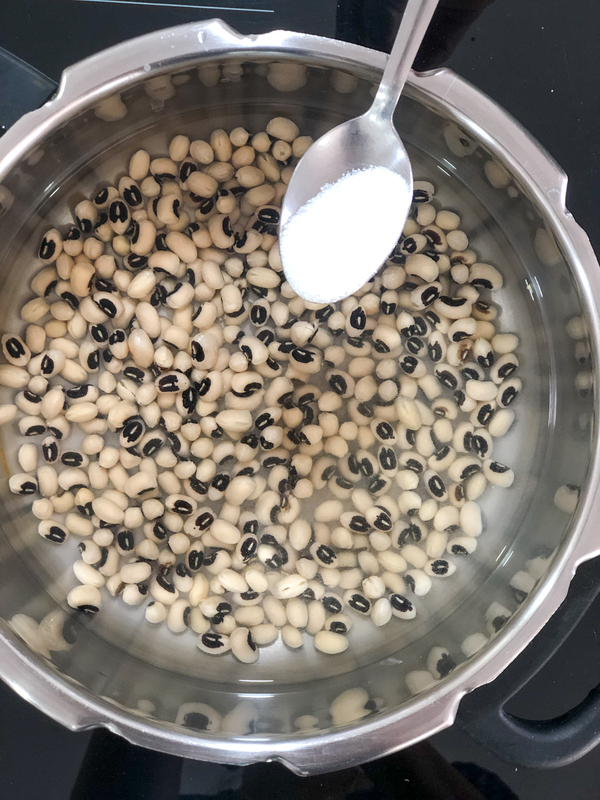 Soak lobia/ black eyed beans for half and hour. Wash the palak and tear them in half. Step 2: Add lobia/ black eyed beans in a pressure cooker with two cups water and salt. Step 3: Add turmeric, close the pressure cooker lid and pressure cook lobia/ black eyed beans for 5 whistles on medium flame. Step 4: Roast all the whole spices in a pan till a nice aroma is released, for about a minute and add them to a mixer grinder. Step 5: In the same pan add a teaspoon of coconut oil, onions and garlic and saute for a minute. Then add coconut and roast till coconut starts to change colour. Step 6: Add the roasted coconut masala after it cools down to the mixer grinder along with the soaked tamarind. Grind to a smooth paste. Step 7: After the dal is cooked add the ground paste to the cooked dal and give it a quick boil. 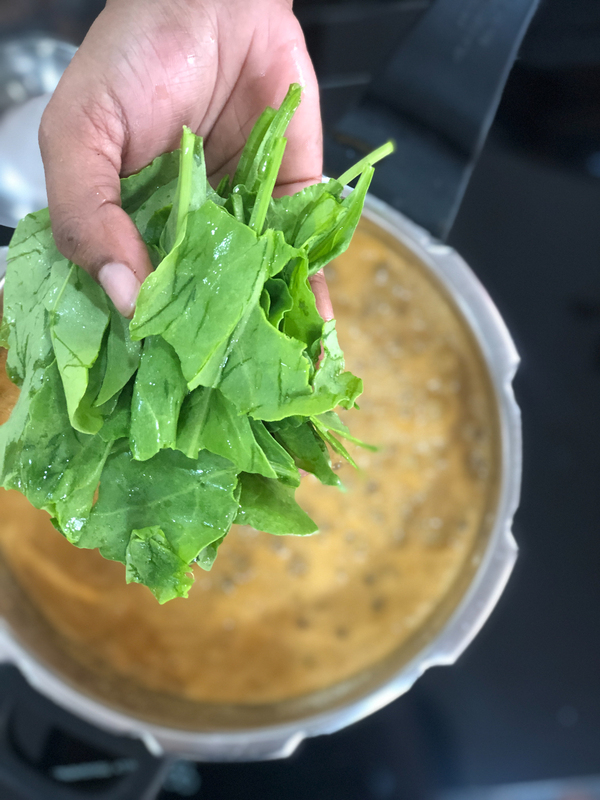 Step 8: Add the torn palak to the lobia masala curry. Step 9: Cook till the palak is cooked and wilted. Turn of the heat. 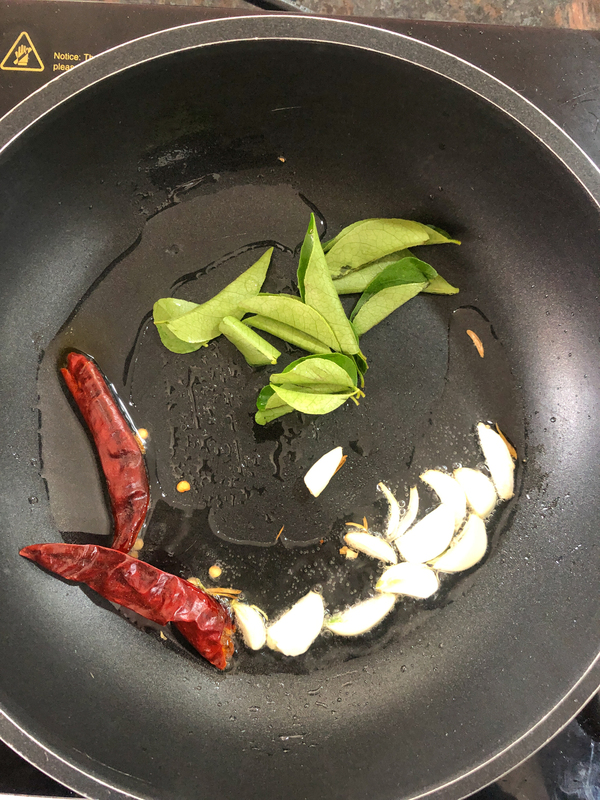 Step 10: Temper Palak Lobia Curry Recipe with curry leaves, red chillies and garlic. 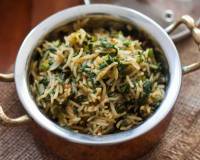 Once the garlic has browned add the tadka to the Palak Lobia Curry. 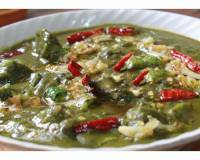 To begin making Palak Lobia Curry Recipe prep all the ingredients and keep them ready. 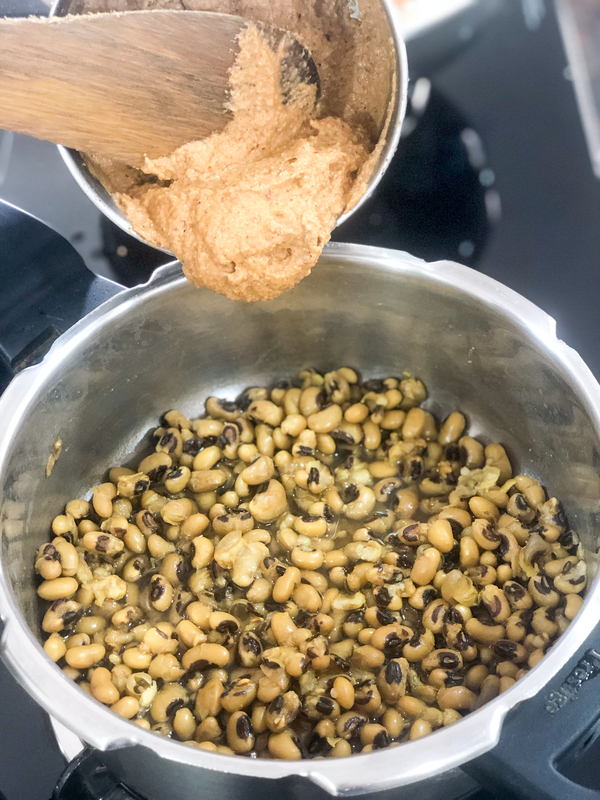 Soak lobia/ black eyed beans for half and hour. Wash the palak and tear them in half. 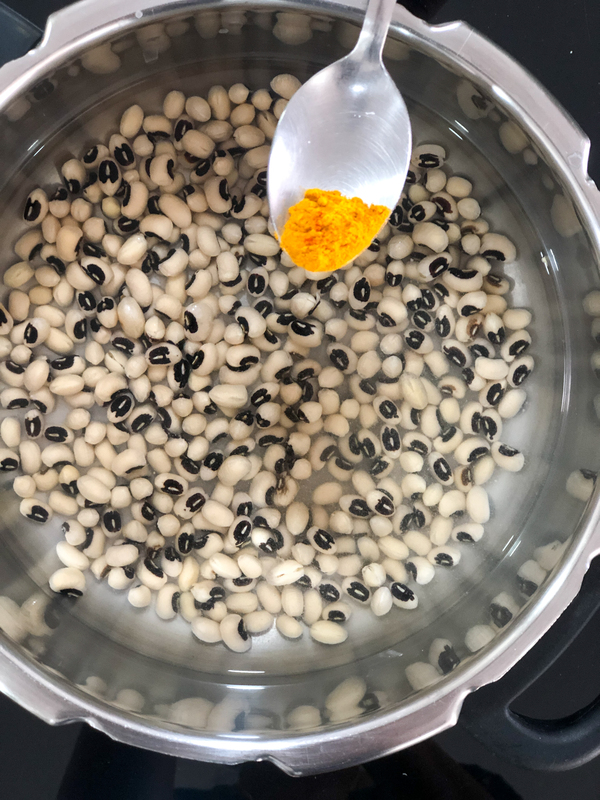 Add lobia/ black eyed beans in a pressure cooker with two cups water and salt and turmeric, close the pressure cooker lid and pressure cook lobia/ black eyed beans for 5 whistles on medium flame. 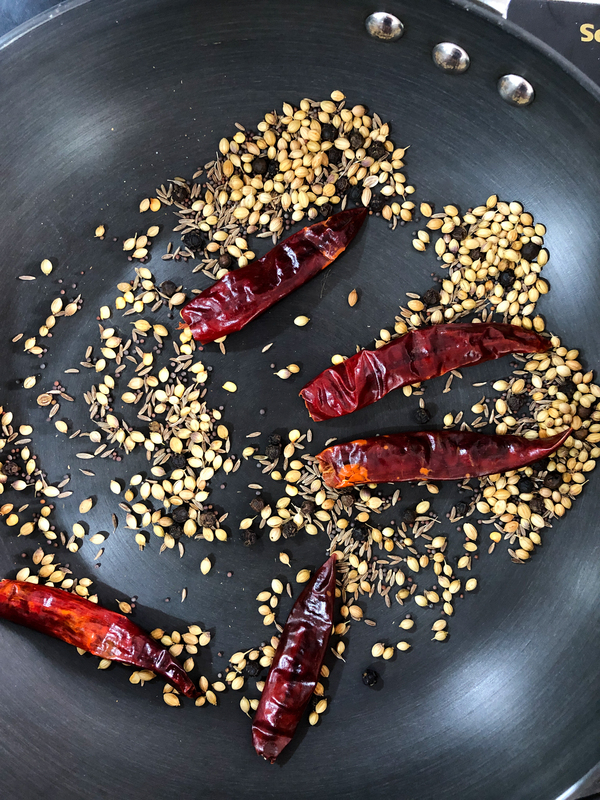 Roast all the ingredients - coriander seeds, cumin seeds, mustard seeds, red chillies, black peppercorns in a pan till a nice aroma is released, for about a minute and add them to a mixer grinder. Allow to cool. In the same pan add a teaspoon of coconut oil, onions and garlic and saute for a minute until the onions soften. Then add coconut and roast till coconut starts to change colour. 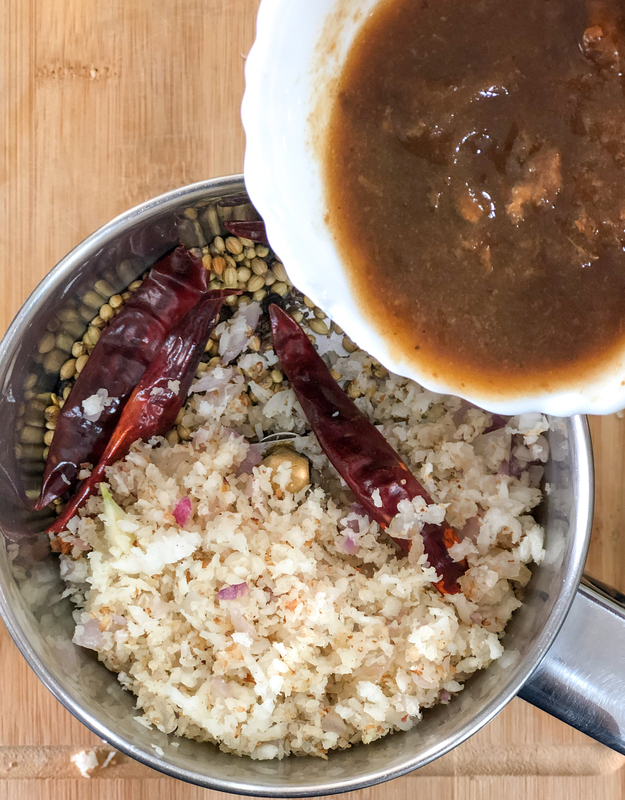 Add the roasted coconut masala after it cools down to the mixer grinder along with the roasted condiments and the soaked tamarind. Grind to a smooth paste. After the black eyed beans is cooked add the above ground paste to the cooked beans and give it a quick boil. 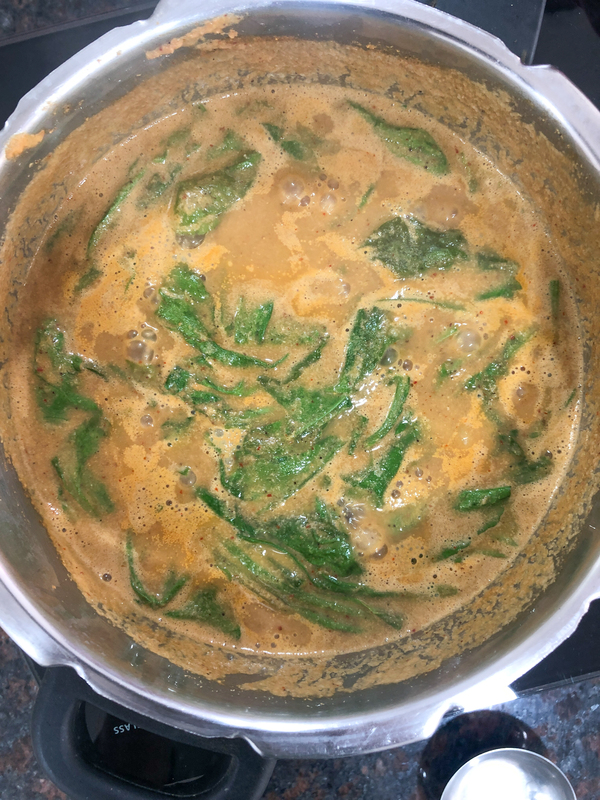 Add the torn palak to the lobia masala curry and simmer for a couple of minutes until the palak cooks and wilts down. Once the palak is cooked, turn off the heat. Check the salt and seasonings and adjust to suit your taste. 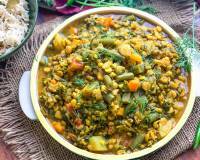 Transfer the palak lobia curry to a serving bowl. The next step is the seasoning/ tadka. 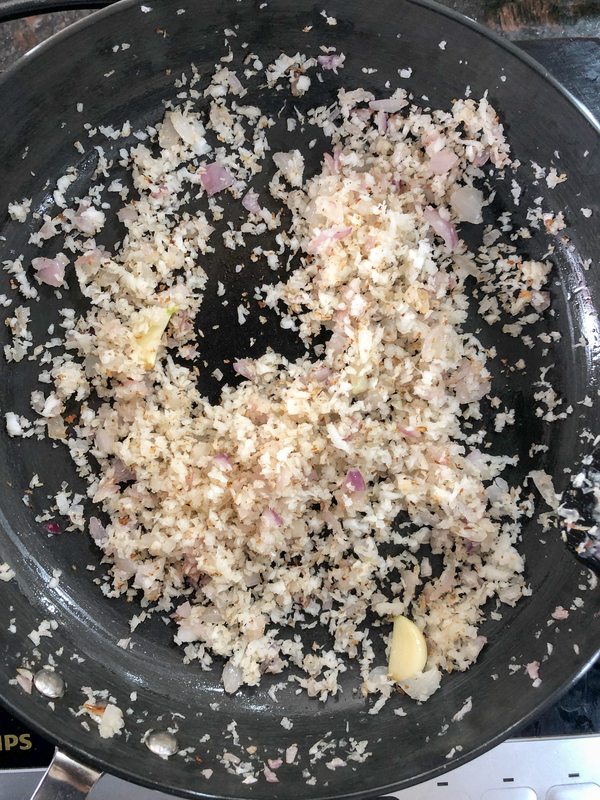 Heat coconut oil in a pan over medium heat; add the cumin seeds and allow it to crackle. Add the curry leaves, red chillies and garlic and saute until the garlic turns slightly brown. 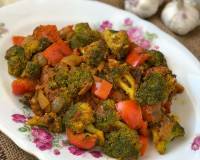 Spoon this seasoning over the the Palak Lobia Curry and serve hot.